Immorality and it's many troubles. 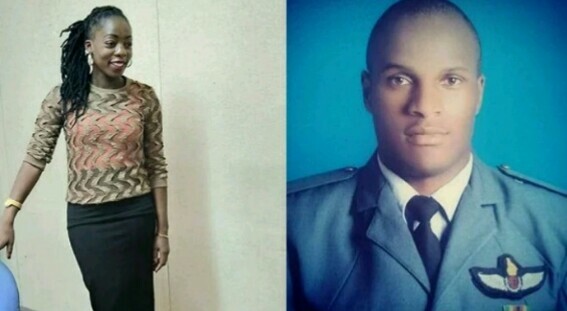 An Airforce of pilot based at Josiah Tungamirai Airbase in Gweru has been arrested for allegedly killing his lawyer girlfriend in a crime of passion on Sunday evening. The Zimbabwean, Tashinga Musonza, 29, allegedly fatally assaulted Miss Lucy Duve, 32, a Gweru-based lawyer who was working for a local Non-Governmental Organisation (NGO) after accusing her of cheating on him with his colleague. Acting Midlands provincial police spokesperson Assistant Inspector Ethel Mukwende, confirmed the incident but said she could not comment on the matter for now. However, prominent Gweru lawyer and deceased friend, Mr Wellington Davira confirmed the alleged murder. “As a colleague and friend, l am very much hurt by such a sudden, violent and painful death Miss Duve suffered. She was a bubbly person who worked well with everyone. Our profession has been robbed of a dedicated and selfless lawyer. I hope and pray that justice will prevail,” said Mr Davira. According to a memorandum from the police, Musonza and Ms Duve were allegedly cohabiting at the latter’s lodgings in Windsor Park suburb. “On the fateful day, Musonza went to their lodgings around 10pm and found Duve asleep. He allegedly started accusing her of cheating on him with his colleague before a misunderstanding ensued. The two then drove to the airbase since Musonza wanted the matter clarified,” reads part of the memo. Upon arrival at the airbase, they allegedly woke up Ms Duve’s alleged lover who denied being in a relationship with her. Musonza, the memo reads, 'allegedly drove his girlfriend to Clay Bank Hospital in the company of two of his colleagues and another female who is said to be Duve’s friend'. “Lucy Duve was pronounced dead upon arrival at the hospital."